Modular versatility allows customization of station positioning. 11-gauge 2"x4" oval and 2" tubular steel frame. Durable electro-static powder coat finish in modern Platinum Sparkle and Catheral Gray. Full length steel weight shrouds and cover plates enhance aesthetics and user safety. Integrated exercise placards on weight shrouds provide station description and exercise instruction. 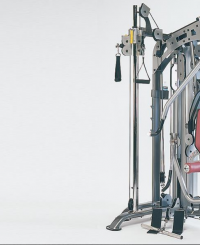 Elevated frame and integrated rubber stabilizer feet enhance strength and stability. Single station attachment complete with hardware and cable. Adjustable back support for proper body alignment. Single station attachment complete with hardware and cable. Fully adjustable high-mid-low cable exercises. Single station attachment complete with hardware and cable. Telescoping back support adjustment. Large rubber padded press plate. Never ask for a spot again! Proprietary “Quad-Lock” braking system combined with the free-form bar (Omni-Directional) linear guide system allowing vertical, horizontal, diagonal lateral and rotational bar movement. 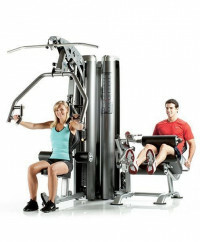 Most compact dual stack gym on the market. Modular versatility allows custom station positioning to accommodate various room configurations. • Durable electro-static powder coat finish in modern Platinum Sparkle and Catheral Gray. 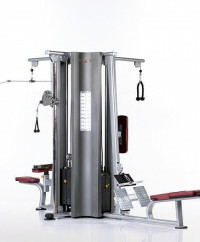 Full length steel weight shrouds and cover plates enhance aesthetics and user safety. Integrated exercise placards on weight shrouds provide station description and exercise instruction. 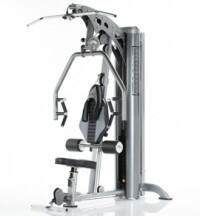 Elevated frame and integrated rubber stabilizer feet enhance strength and stability. 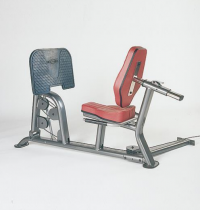 Allows for multiple simultaneous users from three independent 200 lbs. steel weight stacks. 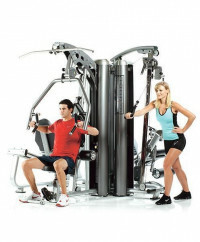 Combination Multi-Press/Row Station, Leg extension/Curl Station and 15-position Hi/Low Station as shown (other configurations and combinations available). 11-gauge 2"x4" oval and 2" tubular steel frame. Durable electro-static powder coat finish in modern Platinum Sparkle and Catheral Gray. 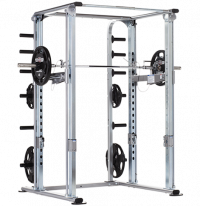 Full length steel weight shrouds and cover plates enhance aesthetics and user safety. Integrated exercise placards on weight shrouds provide station description and exercise instruction. 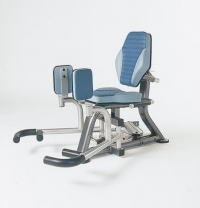 Elevated frame and integrated rubber stabilizer feet enhance strength and stability.